Melvil Dewey was a one-man Silicon Valley born a century before Steve Jobs. He was the quintessential Industrial Age entrepreneur, but unlike the Carnegies and Rockefellers, with their industries of heavy materiality and heavy labor, Dewey sold ideas. His ambition revealed itself early: in 1876, shortly after graduating from Amherst College, he copyrighted his library classification scheme. That same year, he helped found the American Library Association, served as founding editor of Library Journal, and launched the American Metric Bureau, which campaigned for adoption of the metric system. He was 24 years old. He had already established the Library Bureau, a company that sold (and helped standardize) library supplies, furniture, media display and storage devices, and equipment for managing the circulation of collection materials. Its catalog (which would later include another Dewey invention, the hanging vertical file) represented the library as a “machine” of uplift and enlightenment that enabled proto-Taylorist approaches to public education and the provision of social services. As chief librarian at Columbia College, Dewey established the first library school — called, notably, the School of Library Economy — whose first class was 85% female; then he brought the school to Albany, where he directed the New York State Library. In his spare time, he founded the Lake Placid Club and helped win the bid for the 1932 Winter Olympics. Dewey was thus simultaneously in the furniture business, the office-supply business, the consulting business, the publishing business, the education business, the human resources business, and what we might today call the “knowledge solutions” business. Not only did he recognize the potential for monetizing and cross-promoting his work across these fields; he also saw that each field would be the better for it. His career (which was not without its significant controversies) embodied a belief that classification systems and labeling standards and furniture designs and people work best when they work towards the same end — in other words, that intellectual and material systems and labor practices are mutually constructed and mutually reinforcing. Today’s libraries, Apple-era versions of the Dewey/Carnegie institution, continue to materialize, at multiple scales, their underlying bureaucratic and epistemic structures — from the design of their web interfaces to the architecture of their buildings to the networking of their technical infrastructures. This has been true of knowledge institutions throughout history, and it will be true of our future institutions, too. I propose that thinking about the library as a network of integrated, mutually reinforcing, evolving infrastructures — in particular, architectural, technological, social, epistemological and ethical infrastructures — can help us better identify what roles we want our libraries to serve, and what we can reasonably expect of them. What ideas, values and social responsibilities can we scaffold within the library’s material systems — its walls and wires, shelves and servers? 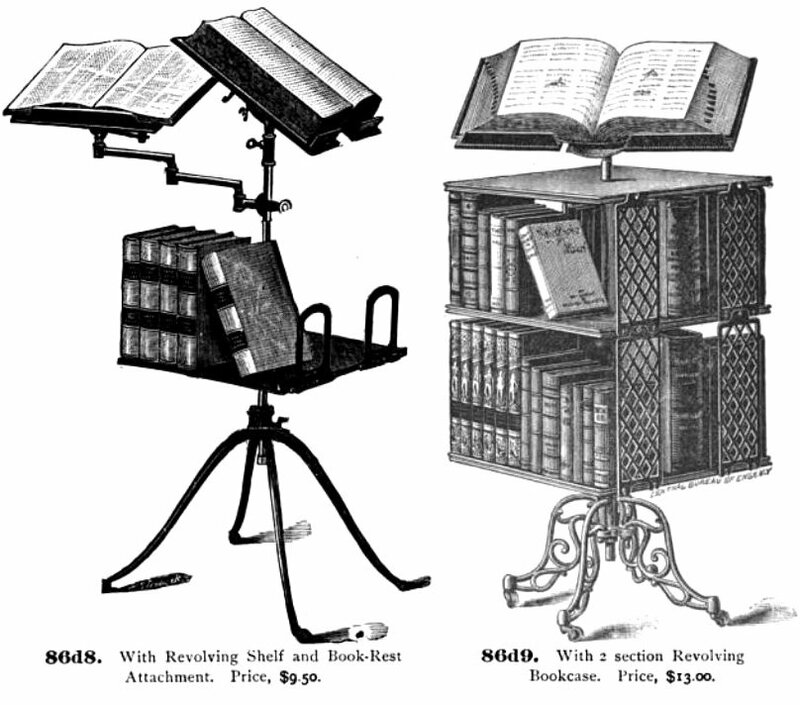 Dictionary stands from the Library Bureau’s 1890 catalog. For millennia libraries have acquired resources, organized them, preserved them and made them accessible (or not) to patrons. But the forms of those resources have changed — from scrolls and codices; to LPs and LaserDiscs; to e-books, electronic databases and open data sets. Libraries have had at least to comprehend, if not become a key node within, evolving systems of media production and distribution. Consider the medieval scriptoria where manuscripts were produced; the evolution of the publishing industry and book trade after Gutenberg; the rise of information technology and its webs of wires, protocols and regulations. 1 At every stage, the contexts — spatial, political, economic, cultural — in which libraries function have shifted; so they are continuously reinventing themselves and the means by which they provide those vital information services. Libraries have also assumed a host of ever-changing social and symbolic functions. They have been expected to symbolize the eminence of a ruler or state, to integrally link “knowledge” and “power” — and, more recently, to serve as “community centers,” “public squares” or “think tanks.” Even those seemingly modern metaphors have deep histories. The ancient Library of Alexandria was a prototypical think tank, 2 and the early Carnegie buildings of the 1880s were community centers with swimming pools and public baths, bowling alleys, billiard rooms, even rifle ranges, as well as book stacks. 3 As the Carnegie funding program expanded internationally — to more than 2,500 libraries worldwide — secretary James Bertram standardized the design in his 1911 pamphlet “Notes on the Erection of Library Buildings,” which offered grantees a choice of six models, believed to be the work of architect Edward Tilton. Notably, they all included a lecture room. In short, the library has always been a place where informational and social infrastructures intersect within a physical infrastructure that (ideally) supports that program. Now we are seeing the rise of a new metaphor: the library as “platform” — a buzzy word that refers to a base upon which developers create new applications, technologies and processes. In an influential 2012 article in Library Journal, David Weinberger proposed that we think of libraries as “open platforms” — not only for the creation of software, but also for the development of knowledge and community. 4 Weinberger argued that libraries should open up their entire collections, all their metadata, and any technologies they’ve created, and allow anyone to build new products and services on top of that foundation. The platform model, he wrote, “focuses our attention away from the provisioning of resources to the foment” — the “messy, rich networks of people and ideas” — that “those resources engender.” Thus the ancient Library of Alexandria, part of a larger museum with botanical gardens, laboratories, living quarters and dining halls, was a platform not only for the translation and copying of myriad texts and the compilation of a magnificent collection, but also for the launch of works by Euclid, Archimedes, Eratosthenes and their peers. Yet the platform metaphor has limitations. For one thing, it smacks of Silicon Valley entrepreneurial epistemology, which prioritizes “monetizable” “knowledge solutions.” Further, its association with new media tends to bracket out the similarly generative capacities of low-tech, and even non-technical, library resources. One key misperception of those who proclaim the library’s obsolescence is that its function as a knowledge institution can be reduced to its technical services and information offerings. Knowledge is never solely a product of technology and the information it delivers. We need to attend more closely to such “social infrastructures,” the “facilities and conditions that allow connection between people,” says sociologist Eric Klinenberg. In a recent interview, he argued that urban resilience can be measured not only by the condition of transit systems and basic utilities and communication networks, but also by the condition of parks, libraries and community organizations: “open, accessible, and welcoming public places where residents can congregate and provide social support during times of need but also every day.” 11 In his book Heat Wave, Klinenberg noted that a vital public culture in Chicago neighborhoods drew people out of sweltering apartments during the 1995 heat wave, and into cooler public spaces, thus saving lives. Every day at my job I helped people just barely survive. … Forget trying to be the “people’s university” and create a body of well informed citizens. Instead I helped people navigate through the degrading hoops of modern online society, fighting for scraps from the plate, and then kicking back afterwards by pretending to have a farm on Facebook. Read the whole story. It’s quite a punch to the stomach. Given the effort librarians expend in promoting basic literacies, how much more can this social infrastructure support? Should we welcome the “design challenge” to engineer technical and architectural infrastructures to accommodate an ever-diversifying program — or should we consider that we might have stretched this program to its limit, and that no physical infrastructure can effectively scaffold such a motley collection of social services? Again, we need to look to the infrastructural ecology — the larger network of public services and knowledge institutions of which each library is a part. How might towns, cities and regions assess what their various public (and private) institutions are uniquely qualified and sufficiently resourced to do, and then deploy those resources most effectively? Should we regard the library as the territory of the civic mind and ask other social services to attend to the civic body? The assignment of social responsibility isn’t so black and white — nor are the boundaries between mind and body, cognition and affect — but libraries do need to collaborate with other institutions to determine how they leverage the resources of the infrastructural ecology to serve their publics, with each institution and organization contributing what it’s best equipped to contribute — and each operating with a clear sense of its mission and obligation. Libraries have a natural affinity with cultural institutions. Just this spring, New York Mayor Bill de Blasio appointed Tom Finkelpearl as the city’s new Commissioner of Cultural Affairs. A former president of the Queens Museum, Finkelpearl oversaw the first phase of a renovation by Grimshaw Architects, which, in its next phase, will incorporate a Queens Public Library branch — an effective pairing, given the commitment of both institutions to education and local culture. Similarly, Lincoln Center houses the New York Public Library for the Performing Arts. As commissioner, Finkelpearl could broaden support for mixed-use development that strengthens infrastructural ecologies. The CUF/Architectural League project is also considering how collaborative partnerships can inform library program and design. I’ve recently returned from Seattle, where I revisited OMA’s Central Library on its 10th anniversary and toured several new branch libraries. 15 Under the 1998 bond measure “Libraries for All,” citizens voted to tax themselves to support construction of the Central Library and four new branches, and to upgrade every branch in the system. The vibrant, sweeping Ballard branch (2005), by Bohlin Cywinski Jackson, includes a separate entrance for the Ballard Neighborhood Service Center, a “little city hall“ where residents can find information about public services, get pet licenses, pay utility bills, and apply for passports and city jobs. While the librarians undoubtedly field questions about such services, they’re also able to refer patrons next door, where city employees are better equipped to meet their needs — thus affording the library staff more time to answer reference questions and host writing groups and children’s story hours. The “design challenge” is to consider what physical infrastructures would be needed to accommodate such partnerships. 18 Many libraries have continued along a path laid by library innovators from Ptolemy to Carnegie, renovating their buildings to incorporate public gathering, multi-use, and even commercial spaces. In Seattle’s Ballard branch, a large meeting room hosts regular author readings and a vibrant writing group that typically attracts 30 or more participants. In Salt Lake City, the library plaza features an artist co-op, a radio station, a community writing center, the Library Store, and a few cafes — all private businesses whose ethos is consistent with the library’s. The New York Public Library has recently announced that some of its branches will serve as “learning hubs” for Coursera, the provider of “massive open online courses.” And many libraries have classrooms and labs where they offer regular technical training courses. These entrepreneurial models reflect what seems to be an increasingly widespread sentiment: that while libraries continue to serve a vital role as “opportunity institutions” for the disenfranchised, this cannot be their primary self-justification. They cannot duplicate the responsibilities of our community centers and social service agencies. “Their narrative” — or what I’d call an “epistemic framing,” by which I mean the way the library packages its program as a knowledge institution, and the infrastructures that support it — “must include everyone,” says the University of Michigan’s Kristin Fontichiaro. 19 What programs and services are consistent with an institution dedicated to lifelong learning? Should libraries be reconceived as hubs for civic engagement, where communities can discuss local issues, create media, and archive community history? 20 Should they incorporate media production studios, maker-spaces and hacker labs, repositioning themselves in an evolving ecology of information and educational infrastructures? These new social functions — which may require new physical infrastructures to support them — broaden the library’s narrative to include everyone, not only the “have-nots.” This is not to say that the library should abandon the needy and focus on an elite patron group; rather, the library should incorporate the “enfranchised” as a key public, both so that the institution can reinforce its mission as a social infrastructure for an inclusive public, and so that privileged, educated users can bring their knowledge and talents to the library and offer them up as social-infrastructural resources. The [American Library Association] has a proven history of commitment to intellectual freedom. The public service that we’ve been replaced with has a spotty history of “not being evil.” When we’re gone, you middle class, you wealthy, you tech-savvy, who will fight for that with no profit motivation? Even if you never step foot in our doors, and all of your media comes to a brightly lit screen, we’re still working for you. The library’s social infrastructure thus benefits even those who don’t have an immediate need for its space or its services. Adjaye is so attuned to the nuances of urban context that one might be hard pressed to identify them as the work of one designer. Francis Gregory is steel and glass, Bellevue is concrete and wood. Francis Gregory presents a single monolithic volume, Bellevue an irregular accretion of concrete pavilions. Context drives the aesthetic. His designs “make of this humble municipal building an arena for social interaction, …a distinctive civic icon that helps build a sense of common identity.” This kind of social infrastructure serves a vital need for an entire community. Of course, we must not forget the library collection itself. The old-fashioned bookstack was at the center of the recent debate over the proposed renovation of the New York Public Library’s Schwartzman Building on 42nd Street, which was cancelled last month after more than a year of lawsuits and protests. This storage infrastructure, and the delivery system it accommodates, have tremendous significance even in a digital age. For scholars, the stacks represent near-instant access to any materials within the extensive collection. Architectural historians defended the historical significance of the stacks, and engineers argued that they are critical to the structural integrity of the building. The way a library’s collection is stored and made accessible shapes the intellectual infrastructure of the institution. The Seattle Public Library uses translucent acrylic bookcases made by Spacesaver — and even here this seemingly mundane, utilitarian consideration cultivates a character, an ambience, that reflects the library’s identity and its intellectual values. It might sound corny, but the luminescent glow permeating the stacks acts as a beacon, a welcoming gesture. 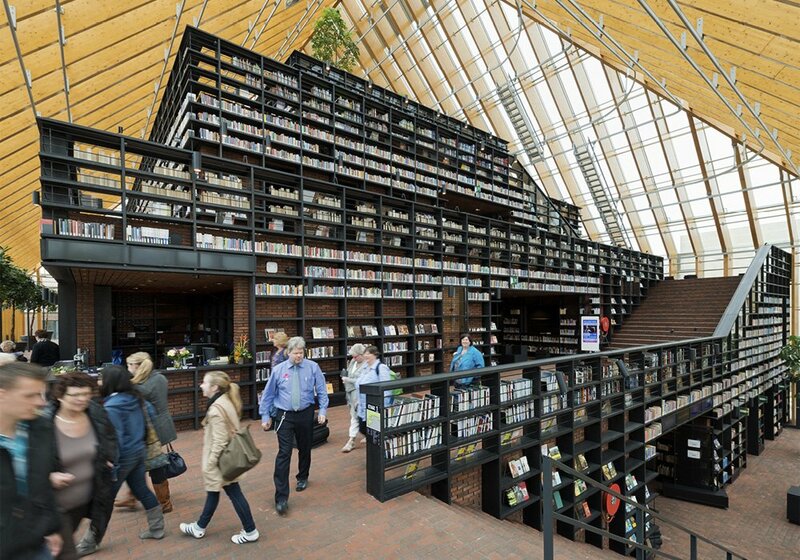 There are still many contemporary libraries that privilege — perhaps even fetishize — the book and the bookstack: take MVRDV’s Book Mountain (2012), for a town in the Netherlands; or TAX arquitectura’s Biblioteca Jose Vasconcelos (2006) in Mexico City. Stacks occupy a different, though also fetishized, space in Helmut Jahn’s Mansueto Library (2011) at the University of Chicago, which mixes diverse infrastructures to accommodate media of varying materialities: a grand reading room, a conservation department, a digitization department, and a subterranean warehouse of books retrieved by robot. (It’s worth noting that Boston and other libraries contained book railways and conveyer belt retrieval systems — proto-robots — a century ago.) Snøhetta’s James B. Hunt Jr. Library (2013) at North Carolina State University also incorporates a robotic storage and retrieval system, so that the library can store more books on site, as well as meet its goal of providing seating for 20 percent of the student population. 23 Here the patrons come before the collection. The Hunt Library has a maker-space, a GameLab, various other production labs and studios, an immersion theater, and, rather eyebrow-raisingly, an Apple Technology Showcase (named after library donors whose surname is Apple, with an intentional pun on the electronics company). 26 One might think major funding is needed for those kinds of programs, but the trend actually began in 2011 in tiny Fayetteville, New York (pop. 4,373), thought to be the first public library to have incorporated a maker-space. The following year, the Carnegie Libraries of Pittsburgh — which for years has hosted film competitions, gaming tournaments, and media-making projects for youth — launched, with Google and Heinz Foundation support, The Labs: weekly workshops at three locations where teenagers can access equipment, software and mentors. Around the same time, Chattanooga — a city blessed with a super-high-speed municipal fiber network — opened its lauded 4th Floor, a 12,000-square foot “public laboratory and educational facility” that “supports the production, connection, and sharing of knowledge by offering access to tools and instruction.” Those tools include 3D printers, laser cutters and vinyl cutters, and the instruction includes everything from tech classes, to incubator projects for female tech entrepreneurs, to business pitch competitions. Last year, the Brooklyn Public Library, just a couple blocks from where I live, opened its Levy Info Commons, which includes space for laptop users and lots of desktop machines featuring creative software suites; seven reserveable teleconference-ready meeting rooms, including one that doubles as a recording studio; and a training lab, which offers an array of digital media workshops led by a local arts and design organization and also invites patrons to lead their own courses. A typical month on their robust event calendar includes resume editing workshops, a Creative Business Tech prototyping workshop, individual meetings with business counselors, Teen Tech tutorials, computer classes for seniors, workshops on podcasting and oral history and “adaptive gaming” for people with disabilities, and even an audio-recording and editing workshop targeted to poets, to help them disseminate their work in new formats. Also last year, the Martin Luther King, Jr., Memorial Library in Washington, D.C., opened its Digital Commons, where patrons can use a print-on-demand bookmaking machine, a 3D printer, and a co-working space known as the “Dream Lab,” or try out a variety of e-book readers. The Chicago Public Library partnered with the Museum of Science and Industry to open a pop-up maker lab featuring open-source design software, laser cutters, a milling machine, and (of course) 3D printers — not one, but three. Some have proposed that libraries — following in the tradition of Alexandria’s “think tank,” and compelled by a desire to “democratize entrepreneurship” — make for ideal co-working or incubator spaces, where patrons with diverse skill sets can organize themselves into start-ups-for-the-people. 27 Others recommend that librarians entrepreneurialize themselves, rebranding themselves as professional consultants in a complex information economy. Librarians, in this view, are uniquely qualified digital literacy tutors; experts in “copyright compliance, licensing, privacy, information use, and ethics”; gurus of “aligning … programs with collections, space, and resources”; skilled creators of “custom ontologies, vocabularies, taxonomies” and structured data; adept practitioners of data mining. 28 Others recommend that libraries get into the content production business. In the face of increasing pressure to rent and license proprietary digital content with stringent use policies, why don’t libraries do more to promote the creation of independent media or develop their own free, open-source technologies? Not many libraries have the time and resources to undertake such endeavors, but NYPL Labs and Harvard’s Library Test Kitchen, have demonstrated what’s possible when even back-of-house library spaces become sites of technological praxis. Unfortunately, those innovative projects are typically hidden behind the interface (as with so much library labor). Why not bring those operations to the front of the building, as part of the public program? These new physical infrastructures create space for an epistemology embracing the integration of knowledge consumption and production, of thinking and making. Yet sometimes I have to wonder, given all the hoopla over “making”: are tools of computational fabrication really the holy grail of the knowledge economy? What knowledge is produced when I churn out, say, a keychain on a MakerBot? I worry that the boosterism surrounding such projects — and the much-deserved acclaim they’ve received for “rebranding” the library — glosses over the neoliberal values that these technologies sometimes embody. Neoliberalism channels the pursuit of individual freedom through property rights and free markets 30 — and what better way to express yourself than by 3D-printing a bust of your own head at the library, or using the library’s CNC router to launch your customizable cutting board business on Etsy? While librarians have long been advocates of free and democratic access to information, I trust — I hope — that they’re helping their patrons to cultivate a critical perspective regarding the politics of “technological innovation” — and the potential instrumentalism of makerhood. Sure, Dewey was part of this instrumentalist tradition, too. But our contemporary pursuit of “innovation” promotes the idea that “making new stuff” = “producing knowledge,” which can be a dangerous falsehood. Library staff might want to take up the critique of “innovation,” too. Each new Google product release, new mobile technology development, new e-reader launch brings new opportunities for the library to innovate in response. And while “keeping current” is a crucial goal, it’s important to place that pursuit in a larger cultural, political-economic and institutional context. Striving to stay technologically relevant can backfire when it means merely responding to the profit-driven innovations of commercial media; we see these mistakes — innovation for innovation’s sake — in the ed-tech arena quite often. Libraries need to stay focused on their long-term cultural goals — which should hold true regardless of what Google decides to do tomorrow — and on their place within the larger infrastructural ecology. They also need to consider how their various infrastructural identities map onto each other, or don’t. 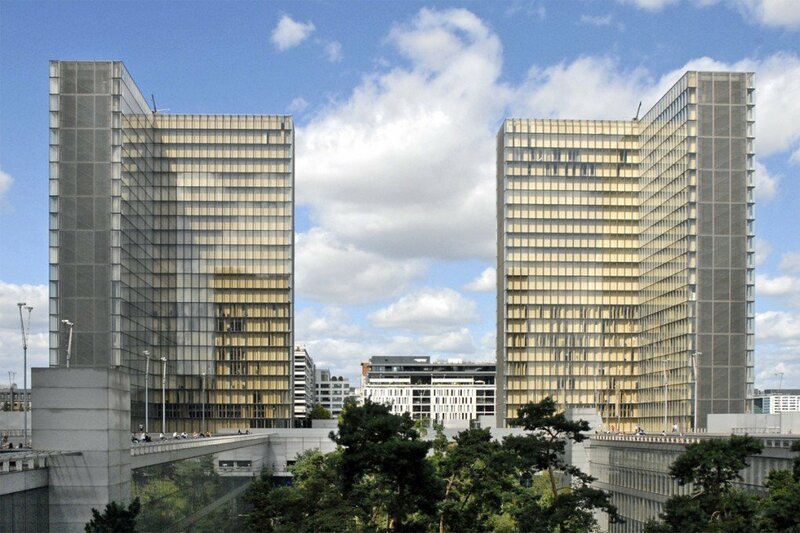 Can an institution whose technical and physical infrastructure is governed by the pursuit of innovation also fulfill its obligations as a social infrastructure serving the disenfranchised? What ethics are embodied in the single-minded pursuit of “the latest” technologies, or the equation of learning with entrepreneurialism? Libraries, she argued, “will always be at a disadvantage” to Google and Amazon because they value privacy; they refuse to exploit users’ private data to improve the search experience. Yet libraries’ failure to compete in efficiency is what affords them the opportunity to offer a “different kind of social reality.” I’d venture that there is room for entrepreneurial learning in the library, but there also has to be room for that alternate reality where knowledge needn’t have monetary value, where learning isn’t driven by a profit motive. We can accommodate both spaces for entrepreneurship and spaces of exception, provided the institution has a strong epistemic framing that encompasses both. This means that the library needs to know how to read itself as a social-technical-intellectual infrastructure. It’s particularly important to cultivate these critical capacities — the ability to “read” our libraries’ multiple infrastructures and the politics and ethics they embody — when the concrete infrastructures look like San Antonio’s BiblioTech, a “bookless” library featuring 10,000 e-books, downloadable via the 3M Cloud App; 600 circulating “stripped down” 3M e-readers; 200 “enhanced” tablets for kids; and, for use on-site, 48 computers, plus laptops and iPads. The library, which opened last fall, also offers computer classes and meeting space, but it’s all locked within a proprietary platformed world. In libraries like BiblioTech — and the Digital Public Library of America — the collection itself is off-site. Do patrons wonder where, exactly, all those books and periodicals and cloud-based materials live? What’s under, or floating above, the “platform”? Do they think about the algorithms that lead them to particular library materials, and the conduits and protocols through which they access them? Do they consider what it means to supplant bookstacks with server stacks — whose metal racks we can’t kick, lights we can’t adjust, knobs we can’t fiddle with? Do they think about the librarians negotiating access licenses and adding metadata to “digital assets,” or the engineers maintaining the servers? With the increasing recession of these technical infrastructures — and the human labor that supports them — further off-site, behind the interface, deeper inside the black box, how can we understand the ways in which those structures structure our intellect and sociality? We need to develop — both among library patrons and librarians themselves — new critical capacities to understand the distributed physical, technical and social architectures that scaffold our institutions of knowledge and program our values. And we must consider where those infrastructures intersect — where they should be, and perhaps aren’t, mutually reinforcing one another. When do our social obligations compromise our intellectual aspirations, or vice versa? And when do those social or intellectual aspirations for the library exceed — or fail to fully exploit — the capacities of our architectural and technological infrastructures? Ultimately, we need to ensure that we have a strong epistemological framework — a narrative that explains how the library promotes learning and stewards knowledge — so that everything hangs together, so there’s some institutional coherence. We need to sync the library’s intersecting infrastructures so that they work together to support our shared intellectual and ethical goals. I’d like to thank the students in my “Archives, Libraries and Databases” seminar and my “Digital Archives” studio at The New School, who’ve given me much food for thought over the years. Thanks, too, to my colleagues at the Architectural League of New York and the Center for an Urban Future. I owe a debt of gratitude also to Gabrielle Dean, her students, and her colleagues at Johns Hopkins, who gave me an opportunity to share a preliminary draft of this work. They, along with my colleagues Julie Foulkes and Aleksandra Wagner, offered feedback for which I’m very grateful. See Matthew Battles, Library: An Unquiet History (New York: W.W. Norton, 2003); Lionel Casson, Libraries in the Ancient World (New Haven: Yale University Press, 2001); Fred Lerner, The Story of Libraries (New York: Continuum, 1999). Casson explains that when Alexandria was a brand new city in the third century B.C., its founders enticed intellectuals to the city — in an attempt to establish it as a cultural center — with the famous Museum, “a figurative temple for the muses, a place for cultivating the arts they symbolized. It was an ancient version of a think-tank: the members, consisting of noted writers, poets, scientists, and scholars, were appointed by the Ptolemies for life and enjoyed a handsome salary, tax exemption … free lodging, and food. … It was for them that the Ptolemies founded the library of Alexandria” [33-34]. Donald Oehlerts, Books and Blueprints: Building America’s Public Libraries (New York: Greenwood Press, 1991): 62. David Weinberger, “Library as Platform,” Library Journal (September 4, 2012). For more on “infrastructural ecologies,” see Reyner Banham, Los Angeles: The Architecture of Four Ecologies(Berkeley, University of California Press, 2009 ); Alan Latham, Derek McCormack, Kim McNamara and Donald McNeil, Key Concepts in Urban Geography (Thousand Oaks, CA: Sage, 2009): 32; Ming Xu and Josh P. Newell, “Infrastructure Ecology: A Conceptual Mode for Understanding Urban Sustainability,” Sixth International Conference of the International Society for Industrial Ecology (ISIE) Proceedings, Berkeley, CA, June 7-10, 2011; Anu Ramaswami, Christopher Weible, Deborah Main, Tanya Heikkila, Saba Siddiki, Andrew Duvail, Andrew Pattison and Meghan Bernard, “A Social-Ecological-Infrastructural Systems Framework for Interdisciplinary Study of Sustainable City Systems,” Journal of Industrial Ecology 16:6 (December 2012): 801-13. Most references to infrastructural ecologies — and there are few — pertain to systems at the urban scale, but I believe a library is a sufficiently complicated institution, residing at nexus of myriad networks, that it constitutes an infrastructural ecology in its own right. Center for an Urban Future, “Opportunity Institutions” Conference (March 11, 2013). See also Jesse Hicks and Julie Dressner’s video “Libraries Now: A Day in the Life of NYC’s Branches” (May 16, 2014). Center for an Urban Future, Branches of Opportunity (January 2013): 3. Quoted in Katie Gilbert, “What Is a Library?” Narratively (January 2, 2014). Real estate sales are among the most controversial elements in the New York Public Library’s much-disputed Central Library Plan, which is premised on the sale of the library’s Mid-Manhattan branch and its Science, Industry and Business Library. See Scott Sherman, “The Hidden History of New York City’s Central Library Plan,” The Nation(August 28, 2013). Toyo Ito, “The Building After,” Artforum (September 2013). Eric Klinenberg, “Toward a Stronger Social Infrastructure: A Conversation with Eric Klinenberg,” Urban Omnibus (October 16, 2013). I’m a member of the organizing team for this project, and I hope to write more about its outcomes in a future article for this journal. Michael Kimmelman, “Next Time, Libraries Could Be Our Shelters From the Storm,” New York Times (October 2, 2013). Ruth Faklis, in Joseph Janes, Ed., Library 2020: Today’s Leading Visionaries Describe Tomorrow’s Library(Lanham: Scarecrow Press, 2013): 96-7. 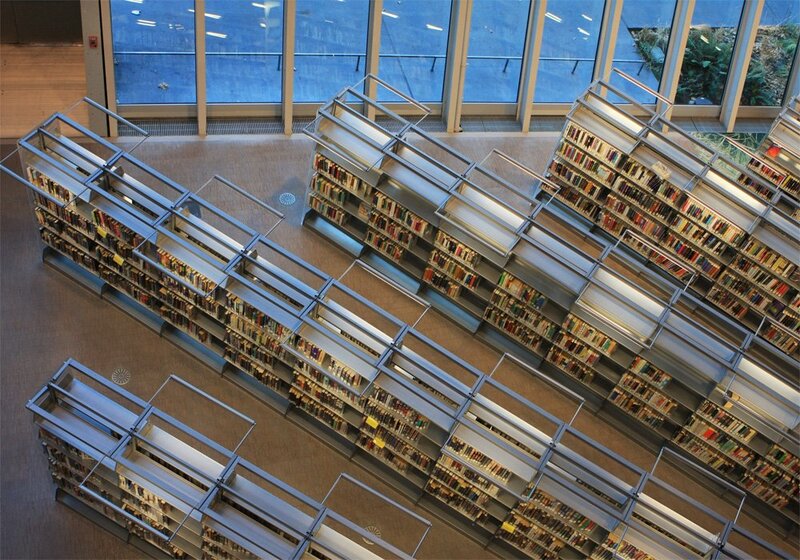 The Seattle Central Library was a focus of my first book, on public library design. See The New Downtown Library: Designing With Communities (Minneapolis: University of Minnesota Press, 2007). Personal communication with Marcellus Turner, March 21, 2014. Marcellus Turner in Library 2020: 92. Ken Worpole addresses library partnerships, and their implications for design in his Contemporary Library Architecture: A Planning and Design Guide (New York: Routledge, 2013). The book offers a comprehensive look the public roles that libraries serve, and how they inform library planning and design. 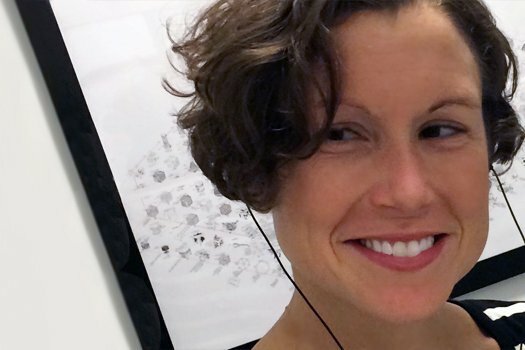 Kristin Fontichiaro in Library 2020: 8. See Bill Ptacek in Library 2020: 119. The quotations are from my earlier article for Places, “Marginalia: Little Libraries in the Urban Margins.” Within mass-digitization projects like Google Books, as Elisabeth Jones explains, “works that are still in copyright but out of print and works of indeterminate copyright status and/or ownership” will fall between the cracks (in Library 2020: 17). I dedicate a chapter in The New Downtown Library to what makes a library “contextual” — and I address just how slippery that term can be. This sentence was amended after publication to note the multiple motives of implementing the bookBot storage and retrieval system; its compact storage allowed the library to reintegrate some collections that were formerly stored off-site. The library has also developed a Virtual Browse catalog system, which aims to promote virtual discovery that isn’t possible in the physical stacks. According to a late 2013 web-based survey of libraries, 41 percent of respondents provide maker-spaces or maker activities in their libraries, and 36 percent plan to create such spaces in the near future. Most maker-spaces, 51 percent, are in public libraries; 36 percent are in academic libraries; and 9 percent are in school libraries. And among the most popular technologies or technological processes supported in those spaces are computer workstations (67 percent), 3D printers (46 percent), photo editing (45 percent), video editing (43 percent), computer programming/software (39 percent). 33 oercent accommodated digital music recording; 31 percent accommodated 3D modeling, and 30 percent featured work with Arduino and Raspberry Pi circuit boards (Gary Price, “Results From ‘Makerspaces in Libraries’ Study Released,” Library Journal (December 16, 2013). See also James Mitchell, “Beyond the Maker Space,” Library Journal (May 27, 2014). Anne Balsamo, “Videos and Frameworks for ‘Tinkering’ in a Digital Age,” Spotlight on Digital Media and Learning (January 30, 2009). This sentence was amended after publication to note that the Apple Technology Showcase was named after former NCSU faculty member Dr. J. Lawrence Apple and his wife, Ella Apple; in an email to the author, library director Carolyn Argentati wrote that the corporate pun was intentional. Emily Badger, “Why Libraries Should Be the Next Great Start-Up Incubators,” Atlantic Cities (February 19, 2003). Stephen Abram in Library 2020: 46; Courtney Greene in Library 2020: 51. See my “Resonant Texts: Sounds of the Contemporary American Public Library,” The Senses & Society 2:3 (Fall 2007): 277-302. See David Harvey, A Brief History of Neoliberalism (New York: Oxford University Press, 2005). Zadie Smith, “The North West London Blues,” New York Review of Books Blog (June 2, 2012). Barbara Fister, “Some Assumptions About Libraries,” Inside Higher Ed (January 2, 2014). Images of major U.S. hydroelectric dams built during the New Deal. Something to contemplate as the Obama administration tries to stimulate the economy and smarten the energy grid. The emerging field of road ecology will define the next generation of highway design.